caught our fancy. Most of them stocked only about 8-10 good ones. The rest wasn’t even worth a dekko. When my brother-in-law was getting married I failed to get a sari even close to what I was aspiring to wear during the wedding. That was a wake-up call,” recalls Agarwal. The two women embarked to Varanasi to analyse the ground situation. “We wanted to enlighten ourselves about the procedure and the craft. 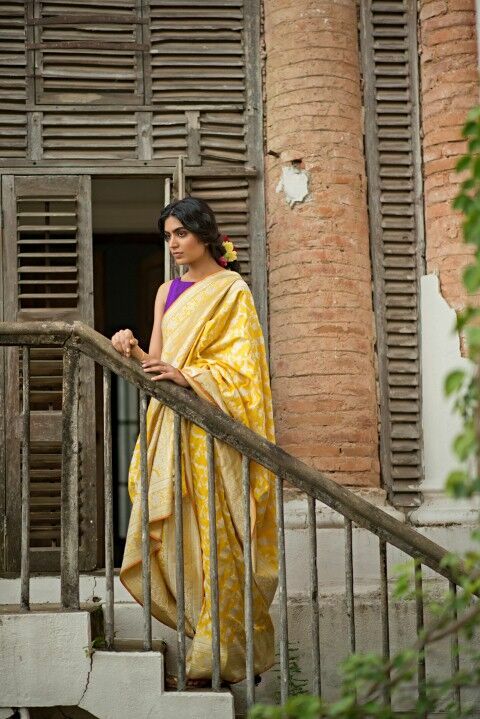 During one rendezvous with an award-winning master weaver we implored him to create a sari with an ancient pattern. His reply baffled us. He lamented the decline of such elaborate weaves citing lack of demand. When probed further he revealed that artisans were forced by the traders to create only certain types of saris. What emerged out of the discussion was that these brilliant craftsmen were subject to skewed up market mechanics, often manipulated by the traders. Amidst this fracas, the stunning design graphs were getting lost,” elaborate the duo. cherishes it even more. The play of colours, a handiwork of Jalan, coupled with interesting blouses, give the saris a contemporary spin. It’s been an uphill task educating the buyer about the luxury aspect of their work. They were bombarded with remarks about the relevance of a sari when the entire world was shifting to separates. 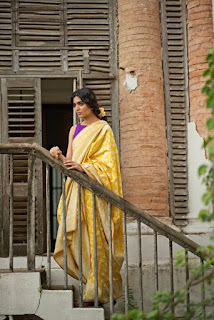 “Even a few years ago, there was this erroneous notion that saris are for women over the hill. Thankfully today, the garment is being celebrated across all age-groups. We created a demand in the market for this kind of luxury saris for women who understand the hard work that goes into its making. We have young entrepreneurs, even living abroad, who proudly drape our saris to important meetings, shunning the pant suit. It gives them that gravitas,” says Jalan. what the market was flooded with. Ingenuity and quality come for a price. As well as the experience,” justifies Agarwal. While each woven heirloom sari is a piece de resistance, the designers are layering the collectible with special features. The creation, neatly wrapped in a muslin cloth, comes in a wooden box that also contains a diary, a authentication certificate of the zari used, a spool of the shimmering thread and a description of the handcrafted piece. There is also a diary to jot down the memories every time you wear it, which eventually can be handed down to generations, with love and anecdotes. “The essentials we provide in the package stretch its longevity, as these are one-off items. 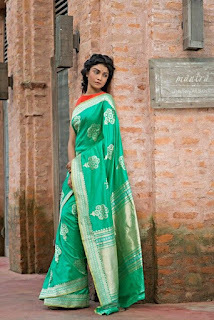 Our banarasi saris and muslins are picked by youngsters who want to flaunt tradition but with an edge,” maintains Jalan. Swati and Sunaina are immensely popular for their concept saris as well. 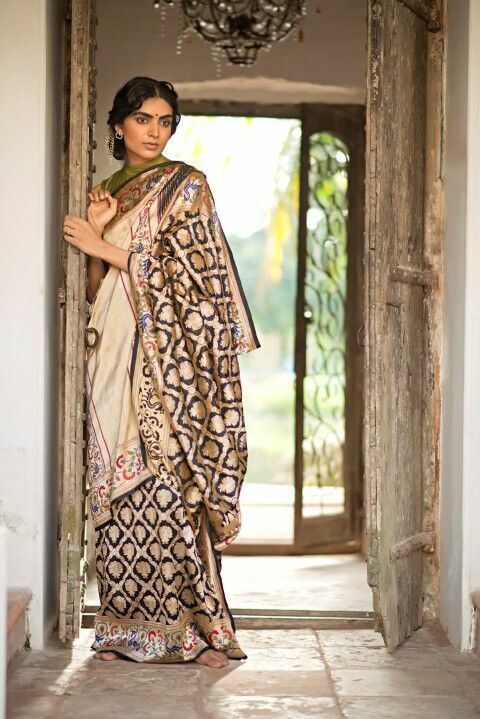 Like an ivory silk sari with real zari raindrops cascading down is helmed by a woven ivory border. Then there is the black and olive mulberry silk woven with hukum bootas reminding one of the spades in a card game. Quirky motifs such as sufi singers, Rajasthani gotapatti, Persian vases, and jhumki bootas run galore in many while there are also the traditional shikaargah patterns as well as figures inspired from the Pichwai paintings of Nathdwara. “The creative faculties might be piqued from anything motivating---Mughal architecture, Persian drawings, South Indian jewellery, Chintz crafts or the bounteous nature. Earlier the weavers prolifically picked designs based on the flora and fauna of Varanasi. We have retained those motifs but keep playing with placements and the geometry involved. 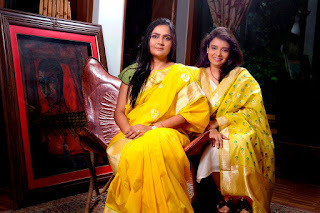 The idea is to make every sari a conversation starter,” end the designer duo.